Burgundy: the "in", trend colour of this season, there's a bunch of "burgundy-esque" offerings (clothes, accessories, handbags, shoes, makeup, nail polishes, you name it) ranging from oxblood to wine to cranberry to plum. I personally favour the more dirtied-brownish-red "old blood" ;-) end of the spectrum in my burgundy than the maroon-purple end, but that's just me. Marc by Marc Jacobs Too Hot To Handle large tote in Cardamom. This is slightly darker than appearing in photos. At around €530 from Brown Thomas though, this one is going to be "have to think about it awhile" purchase. 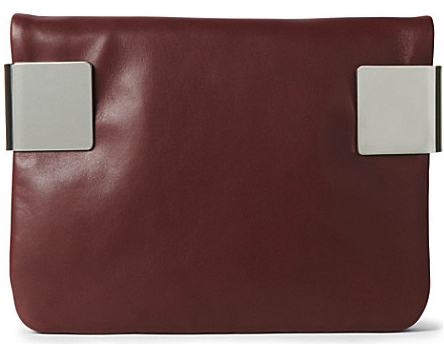 On the other hand, there's this one - it's a limited edition side-tab clutch from DKNY, with the softest softest leather imaginable; slightly too soft in my opinion, as it's going to mark it you look crooked at it. 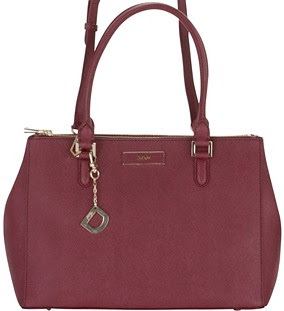 There's also the DKNY Saffiano tote, which I absolutely love, except for the leather, which is hard and feels more like a hard waxed fabric than a leather (and the reason I haven't purchased, despite waiting for it to arrive in-store months ago). It's a nice departure from the rest of the DKNY stuff, which is starting to look a bit samey-samey in the last while. New Look do actually surprisingly affordable, comfortable, wearable and extremely on-trend shoes. Years ago, I stopped buying cheap shoes as they neither last nor are comfortable, but New Look always manages to produce shoes that are both cheap and comfortable, and that last! 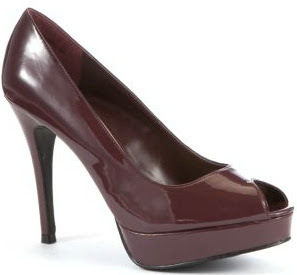 This burgundy patent offering (for less than €30!) are spot-on colour-wise, I would prefer them in a block heel however. On the other hand, this one is cashmere, the gorgeous burgundy Annie cashmere dress from Whistles. Unexciting shape but think how wonderfully warm for the winter! Am quite excited about this one: grown-up and combining the "in" colour with the "in" length (midi); ladylike but with a twist (zips around the waist at the back that can be worn open (for a peek-a-boo waist) or closed), this long sleeve dress by Ann-Sofie, purchasable from Asos. I like the fact that this is not fitted, although it would work as a fitted dress too. My drooled-after Zara wool long-length biker coat with leather sleeves, which I gave up and bought over the weekend :-) This is even nicer when slightly more form-fitting, I recommend going down a size. The lapels look good either opened back or closed up. It's more on the red side of burgundy than the purple side, which I've mentioned I prefer! At €179, affordable if not cheap. 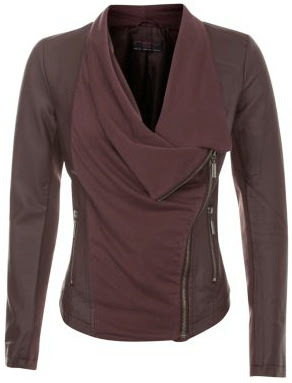 A cheaper alternative, and very cute, is this New Look faux leather sleeved short biker jacket. This one is around the €50 mark. New Look stuff flies out the door, and is one of the better inexpensive high street stores. I love the biker jacket shape and have a few, in a few different styles and colours, but this one, especially with the fabric panel down the front, the leather(ette) sleeves and the slightly draped neck, is bang on trend. I love Oysho stuff, and the 80's are not far away with this lace body! Waxed burgundy pants. I have a pair in black which I just love, and Zara do some gorgeous ones in a chocolate brown at the moment, but I really want some in burgundy. I know Miu Miu do 'em, but forgetabout it. ...will follow a post on burgundy makeup for the AW2012 season... Same bat channel. Keep watching! Update (30/10) - link to Burgundy Part II (The Makeup) here!